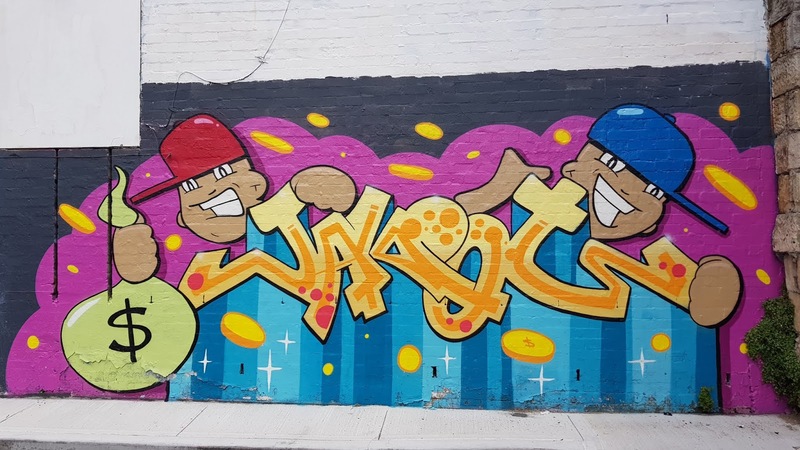 This graffiti art appears on the back wall of a building in William Street, in the inner city eastern suburb of Paddington. Linked to: Monday Mural, Amaze Me Monday, Blue Monday, Ruby Tuesday, Pink Saturday, Through My Lens. ...this one would look right at home here. lots of that here in Eugene Oregon ... I don't understand it, but that is my problem because I am ancient! Nice and bright Jim. Can't figure out what it says though. I wish I knew the meanings behind all the graffiti out there. This one, I guess, says Jackpot? It almost looks as if the artist was paid for his/her work! I can never read these things. Stefan, I agree. This one is hard to decipher.